Just a few graphs for an update on housing. Now that the federal websites are back up and running (hooray, data!) I am able to pull the latest permit data from around the state. Overall we have seen some strong growth in new construction activity, as measured by permits, in the past couple of years. 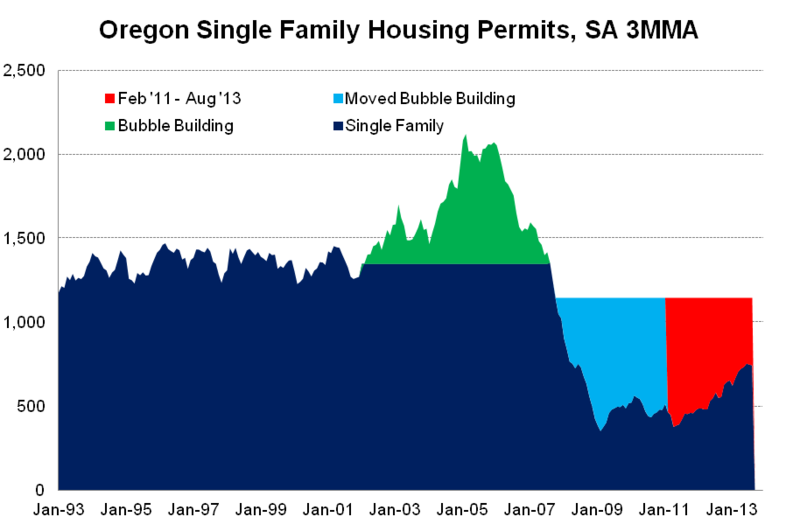 Initially this growth was led more by multi-family projects, predominantly in the Portland area plus college-related activity in Corvallis and Eugene, however the steady advancements in single family permits have been substantial as well. In terms of this growth, it was been quite explosive around the state, particularly in some of our hardest hit metros. 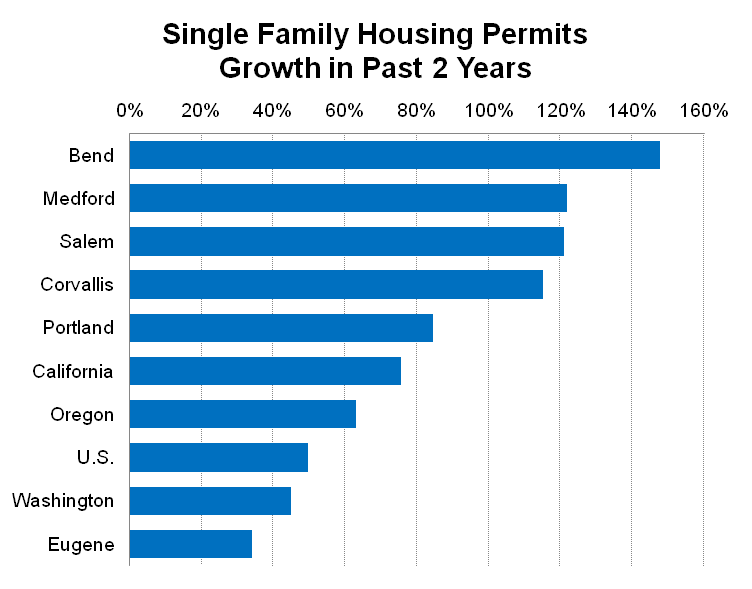 The number of single family permits per month have more than doubled in both Bend and Medford in the past two years. This growth is twice the state’s overall increases of 63% and even stronger than the nation overall at 50% gains. Clearly though, even such strong growth does not come close to replacing the levels of activity during the housing bubble. 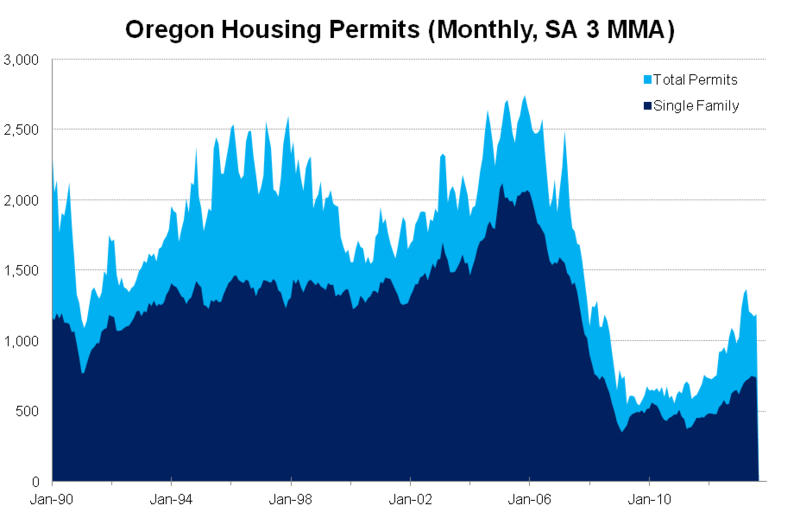 Portland’s current level of permits is still only half as large as seen during 2005 and Bend is at just 1/3rd of such levels. Now, one would not like to return to those bubble days, given the excesses and over reliance on one particular industry, however this just shows the magnitude of the changes. With that being said, we are still very likely underbuilding today (see here for more on how this graph is created). 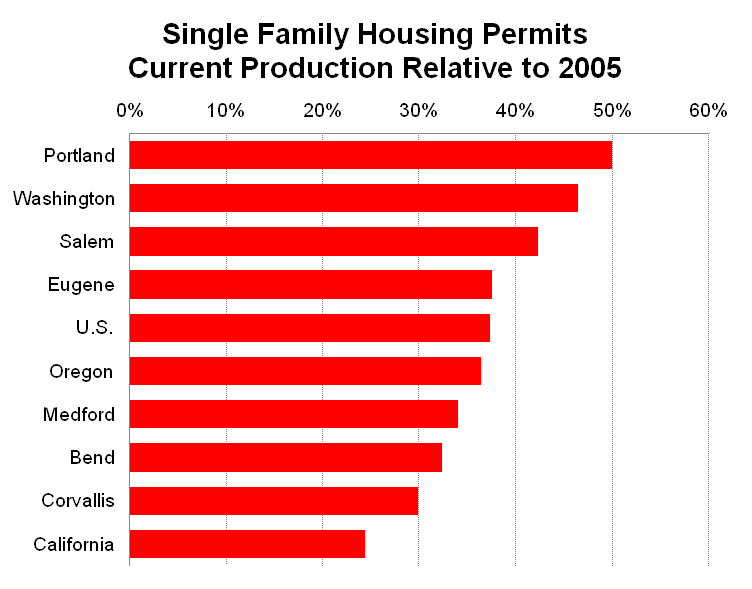 My back of the envelope math says we’re about 16 months behind in new single family homes, of which will likely need to be built in the coming years to meet demand. As household formation picks up, due to a stronger economy with more jobs and more income, the demand for housing will as well. Don’t forget that the demographics are in our favor as well with the millenials and children of the Baby Boomers entering into their root setting years of 25-35 years old. 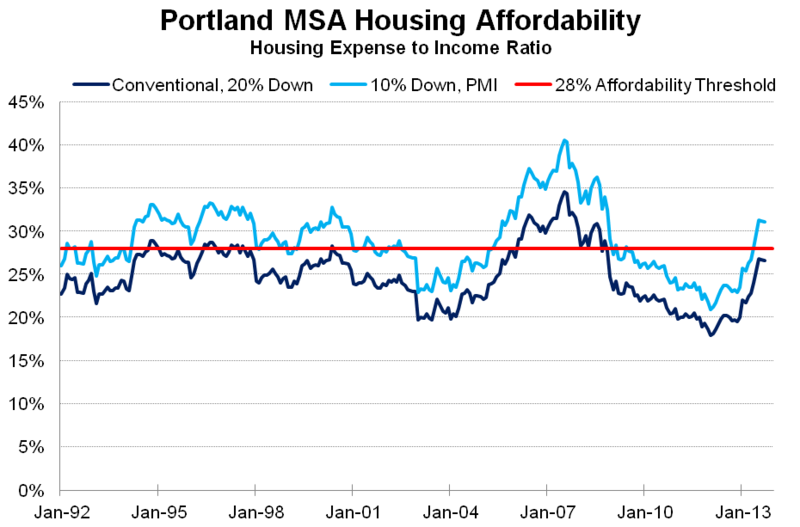 In terms of prices and affordability, after rising briskly through the first half of 2013, things have leveled off in recent months. Prices, while still strong on a year-over-year basis, have held steady the past few months, as have 30 year mortgage rates. See here for more on our affordability measure. Overall, our outlook for home prices and construction has not changed much in recent years. We are expecting continued improvement in housing starts, due to increases in demand, but also for a supply response from existing homes. With rising prices, more and more homeowners are no longer underwater on their mortgage and would like to sell and get into a different home or housing situation. Also non-distressed homeowners looking to move or downsize now feel more comfortable in terms of selling their homes now that they’re no longer rock bottom prices. 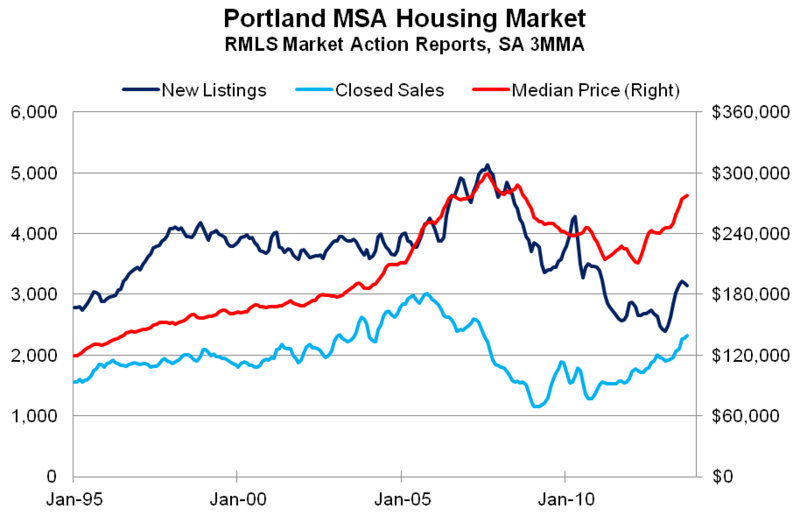 As measured by RMLS, new listings in the Portland MSA have picked up in recent months, however not yet as much as the increase in sales, leading to even higher prices. Over an extended period, we expect home prices to moderate considerably and move more in-line with inflation, however in the near-term until the market finds that nice balance between supply and demand we can likely expect more of the same. With that being said, should interest rates rise even further, and/or if new listings are not prices appropriately, we could even seen some downward movement in prices as the demand for higher priced homes wanes in the face of increased borrowing costs. Again, the market is in a state of flux, trying to find a new equilibrium of supply, demand and prices. I do not think we are quite there yet given the low levels of new construction and new listings, however we are moving in the right direction.